Austin-based tequila company, Amorada Tequila, is co-owned by Terray Glasman, one of the few female tequila makers in the world. The colorful hand-blown glass bottles of Anejo, Blanco, and Reposado are not only visually striking, but patented, and designed by Glasman herself. Currently more than 300 locations nationwide, and now China, carry Amorada. We caught up with the tequila maven via email to find out about her backstory, the nonprofit Amorada beneficiary, and Glasman’s favorite tequila recipes and food pairings. Austin Chronicle: How did you get started in the tequila making business? Terry Glasman: Prior to my launching of Amorada Tequila, I had another company which took me to Mexico often. While visiting Mexico and immersing myself in the culture, I felt a strong pull towards tequila, because I was born in Mexico and it was taking me back to my roots. It was not that difficult of a decision for me to jump right into the Tequila business. The most important thing for me was to tie in the right distillery that had the same passion for tequila as I do. I wanted an all-natural tequila that is made from 100% Weber Blue Agave with no additives, colorants or preservatives. I wanted to bring to Texas, an ultra-smooth tequila that one can truly enjoy on its own. A true sipping tequila. AC: I understand you grew up in Mexico. How/why did you arrive in Leander? TG: Well, I’m originally from Mexico City and my single mom, me and 5 other siblings moved to El Paso, Texas. From there we moved to California and I started my own business when I was 18. I decided to move myself and my daughter to Texas, for a better life, about 15 years ago and settled in Cedar Park, but wanted to get away from the city, so to speak, so I moved to Leander 4 years ago and couldn’t be happier. AC: What’s it like operating a tequila business in Central Texas? TG: Ah, the beautiful state of Texas! Running a tequila business can be tough at times, but it’s a welcomed challenge and I love what I do! Texans welcome and stand behind local products, and I am truly grateful for that. I love the fact that Austin, in particular, is all about supporting local. AC: Tell me about the beautiful bottling – one is hand-blown? TG: Because each and every single bottle is truly handcrafted, no 2 bottles are the same, and to be honest, that is a beautiful thing. Every batch is different and every bottle will not be exact, so there are unique variations in each bottle. The Blanco, (Cobalt Blue) and Reposado (Amber) are molded, however, the Anejo, (the Red bottle) is truly a glass-blown bottle. Every single one of them is handcrafted and hand capped. There is no bottling line per se, even the label is sandblasted by hand, one bottle at a time. We do have several videos showing the process on our website AmoradaTequila.com where the customer can enjoy the making of the bottles. It’s something to see for sure. It is a craft of beauty, passion and love. I always say each bottle has its own unique personality. AC: What are some common misconceptions about tequila that you’ve heard? TG: Oh there is a lot , but some that I can think of is that Tequila comes from a cactus but the truth is that tequila comes from the agave plant, a relative of the Lily family. Another is that tequila should be consumed with salt and lime. 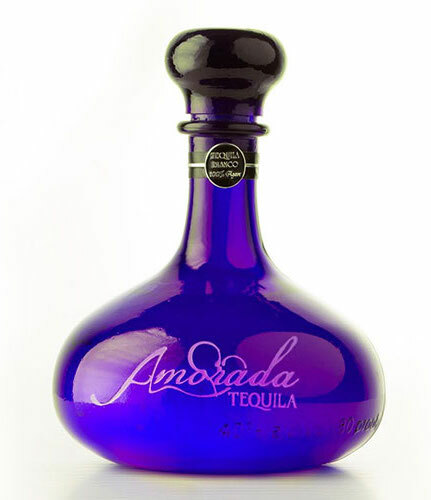 More people are realizing that tequila has come a long way and a good ultra-premium tequila, like Amorada Tequila, is meant to be sipped and not shot down without the masking of salt and lime. I always tell people just think of it like good scotch, fine wine or a elegant Cognac. A good Tequila Is meant to be truly enjoyed one sip at a time. AC: Blanco, Reposado, or Añejo – which tequila is better for making classic cocktails? TG: I think that every one of our Tequilas can make the perfect cocktail. It all depends on the mood, really. For example, the Blanco can be used in a classic margarita with just two other ingredients: lime juice and an orange liqueur. Or you can create a variation of the Mexican-Martini, which we love to do. The Reposado can be used in a top shelf margarita and it’s more flavorful. Because it’s so complex, from being aged in once-used Cognac barrels, we’ve made a Manhattan with it and it’s delicious. The Anjeo – the one that is housed in that beautiful red bottle – is great on its own, but my team loves making Old Fashioneds with it. AC: And what is your favorite summer tequila cocktail? TG: Simply, Amorada Tequila Blanco, lime juice, and splash of Topo Chico. However, one of my favorite summer drinks is the Watermelon Amortini. 1 tablespoon of fine organic sugar, divided. AC: What are some great tequila food pairings? TG: The Blanco goes well with any citrus fruit. Also pairs well with seafood dishes or lightly seasoned poultry dishes. The Reposado goes well with steak and hearty meals. It can really hold its own. Personally, I love ending my steak dinners or any dinner with the Anejo. I add a teaspoon of Luxardo cherry syrup, drop a couple of cherries into the Anejo and it’s dessert in a glass. It’s delicious. AC: Anything else you’d like our readers to know?